We saw it in a limited fashion four years ago. Social media played a big role in the last election, many would say it put our current incumbent in the Oval Office. Now, as election day looms, social media is changing the game drastically. The big difference between last week’s debate and its predecessors was two-screen viewing: people watched the debate online or on TV, but with a laptop, tablet, or smartphone handy the entire time. Both sides of the aisle have, as usual, put forth their preferred narrative of events as the spin doctors went into high gear. Their problem in the current environment comes from the two screens. It’s a lot harder to spin or reframe when the audience you’re spinning for has instantaneous access to stupendous amounts of data. In mere moments after any given statement, Twitter and Facebook were flooded with links to fact-checking sites and other websites providing numbers that would support or disprove it. Where analysis and debate have always been the province of the media, that is no longer so in 2012. Social media has democratized the conversation. With 11.1 million comments, Wednesday’s debate was the fourth most-tweeted telecast of any kind, coming in behind the most recent Grammy awards, MTV’s Video Music Awards and the Super Bowl, according to William Powers, director of The Crowdwire, an election project of Bluefin Labs, a social analytics firm. It was far higher than the previous political record holder: the third night of the Democratic National Convention in September with 2.5 million comments. A significant spike in social media commentary came from women, The Crowdwire found. Some 55 percent of comments about the debate were made by women, compared to just 39 percent during the Republican primary debates. The entire nature of political dialogue is changing before our eyes. The way that things have been done up until now are becoming outmoded by a wilder, more direct form of dialectic. While the numbers may seem to skew the young at the moment, time passes quickly. Kids grow up and have kids of their own, all steeped in the instant access that online communications can provide. No matter how true or false any of these may be from an objective point of view, these are the dominant views of the socially active watchers. What’s interesting are the conversations that these memes arise from — spontaneous, engaged, and often informed. That, my friends, is public opinion forming right before your very eyes. 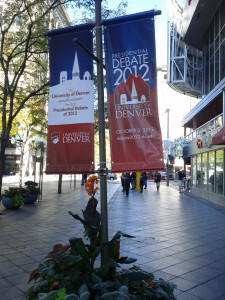 This year, however, the widespread use of social media brought the presidential debate back into the realm of speech. While what we saw is still a factor, those on social networking sites concerned themselves with what each candidate had to say when tackling the issues. What I noticed from social media was a consideration of others’ viewpoints and (mostly) polite divergences. Rather than arguing issues with one another, people were invested in critiquing what their politicians were trying to sell them. This skepticism will serve people, allowing them to be discerning when voting. On a larger scale and swifter than ever before, voters could engage one another in dialogue about what each candidate proclaimed. This dialogue shows investment, which — as low voter turnout, especially among the youth (i.e., social media users) will show — is hard to conjure. The accessibility of online debates via social media facilitated the sharing of knowledge and inspired people to consider others’ opinions. My observations about the critical eye with which online socializers view their candidates were confirmed by a study conducted by the Pew Research Center’s Project for Excellence in Journalism during Republican and Democratic conventions. Pew found the discussions of both candidates during this time was largely negative and critical across the Web. While I am sure there is some used astro turf out there, it sounds like the majority of the people were engaging in serious discussion. Let us hope that is the beginning of a trend!